This evening I was surprised to see that I had been drafted by the Montreal Canadiens. When I took a second look I realized that either my name was misspelled or they drafted someone else. "Montreal used the 20th pick -- acquired earlier from San Jose in exchange for the 20th and 53rd picks -- to choose big Minnesota defenseman David Fischer, and the New York Rangers selected New Jersey defenseman Bob Sanguinetti 21st." I guess it's someone else. My "Fisher" doesn't have a "C" in it. 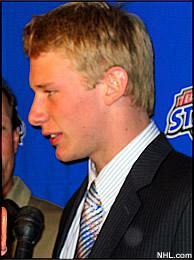 CONGRATULATIONS to Jordan Staal of the Peterborough Petes who was chosen 2nd overall by the Pittsburgh Penguins. 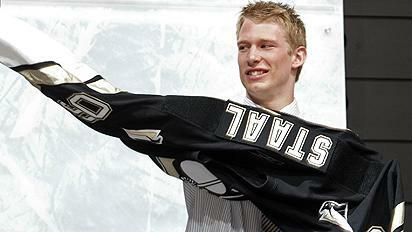 Henry & Linda Staal must be pleased. This couldn't happen to a nicer family!